May is lupus world awareness month, and May 10 is world lupus day. 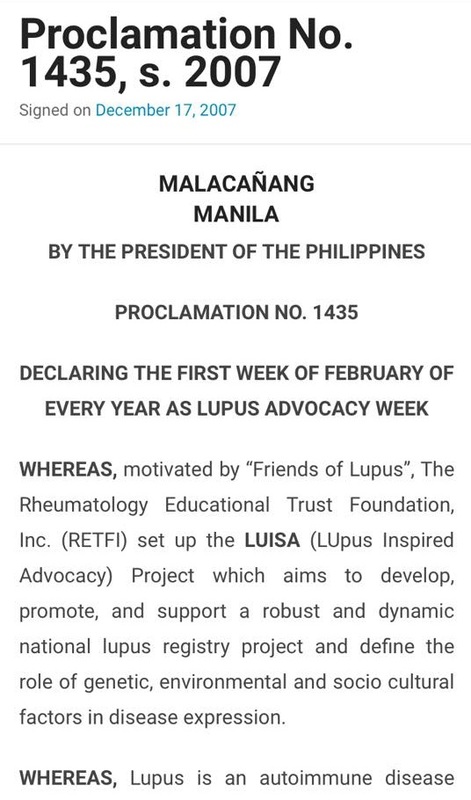 I was not aware that there was a Proclamation in the Philippines in 2007, stating that the 1st week of February is Lupus Advocacy Week. I got an email last week in facebook from Seanta, a fellow lupus patient. She was sharing this information with me, and we started chatting on how we can reach more people for Lupus awareness. Being that my husband and I are based in Kuala Lumpur, and there was no time to prepare, I am doing my share by posting in facebook, and typing away on my keyboard. I hope you can help us too as we try to raise awareness for Lupus. I find that the easiest way to explain lupus is that my antibodies attack my own body. Antibodies are suppose to fight off illnesses, mine don’t know any better. I’ve been living with Lupus for more than 7 years now. I’ve had my ups and downs. My fair share of trials and hardships. Y’all know my story, our 1st daughter, Caitlin, had a complete heart block because my antibodies attacked her heart. She was with us for 11 days. https://kymalupa.com/2013/05/06/my-lupus-story-2/. And my miscarriage with Mary in 2013, https://kymalupa.com/2013/05/29/losing-our-mary/. Through all these heart aches, my husband and I are happy and content. We continue to open our hearts and minds for God’s plan, and fervently pray for a baby, or 5 babies 😉 , to be a part of our future. People always tell me that I am so strong, after having gone through these losses. But in reality, the strength is not from me. I am blessed with a wonderful support system. I have my God whom I always feel is right beside me, holding my hand. I have my husband who is the most amazing and patient person that one could have ever been blessed with. He is just wonderful from head to toe, and he always, always takes care of me no matter what. My family and my in laws, my bestfriends, my friends. Everyone has just been so supportive and inspiring. How can I not wake up everyday and see the beauty in this world? But NOT everyone is blessed with a support system. Not everyone has reached that point in their life where they can see the positive albeit the negative. Not everyone has the resources to be able to take care of themselves the best they can. THIS is why we spread Lupus awareness. Not for me, not for those who cope with the disease. But for those who are struggling. I am just 1 face of lupus. Lupus has many faces. Each and every patient is different. The severity is different. And despite everything that I have gone through, I am still very blessed. Back in Manila, I have visited lupus patients, teenagers, receiving kidney dialysis. Patients who have received knee implants. Patients who have lost soo much more..
Help us as we spread lupus awareness. Knowledge is power. Let us move towards a better year where we are all well informed. A single act of reposting or posting for lupus awareness can do folds of wonder for our advocacy. I hope we can count on you to help us towards our goal.